this has been the best vacuum I have ever owned! Whether it's shedding season for your dog or your cat tracks kitty litter all over the carpet, this revolutionary vacuum is designed to make cleaning up after pets a breeze. Say goodbye to hair with the streamlined Tangle-Free Brush Roll, remove embedded hair in hard to reach areas with specialized pet tools, and help capture allergens with the SmartSeal Allergen System with Febreze. Febreze® is a trademark of The Procter and Gamble Company, Cincinnati, Ohio, used under license by BISSELL Homecare, Inc. This is it! It picks the air up without blowing it all over. Extra large container to capture hair so you're not constantly emptying it. Long cord is a nice feature. We have 3 large and 2 small rescue dogs so we needed a vacuum that really worked hard, and this is the one that has so far stood up to the challenge! Would highly recommend. Works great for pet hair! Very Impressed. This vacuum is absolutely awesome. I have 2 long haired dogs and cleaning up after them is a breeze with the Bissell 1650 Pet Hair Eraser. I vacuumed my carpets with my old vacuum, then vacuumed as soon as I took this one out of the box....and couldn't believe what my old vacuum had missed! I would definitely recommend this with 2 dogs and 3 boys! We were buying a new house with new carpeting and we have 3 cats. I just knew we needed a new vacuum. After reading all the literature on the vacuum, I knew I was making a great choice. We just LOVE this vacuum. It does an excellent job cleaning the bare floors and the carpeted areas. The best part is you never have to touch the gunk! Just release the cylinder and the dirt and fur/hair drops into the dustbin. We love the power of the upright also, and the convenience of the tools, all attached to the base of the vacuum. Would suggest this to anyone who has pets in the house! And the roller never gets tangled, even when sucking up all that hair! Another product we love from Overstock! Easy to handle and I the Febreeze filter is great. The house smells great after vacuuming. Easy to dump after vacuuming as well. This vacuum has been great on the pet hair. Great product! It is really great for pet hair. It makes cleaning the carpet a breeze. It is worth every penny. I am very pleased with my purchase. Great vacuum! We have cats and dogs and this has helped tremendously. 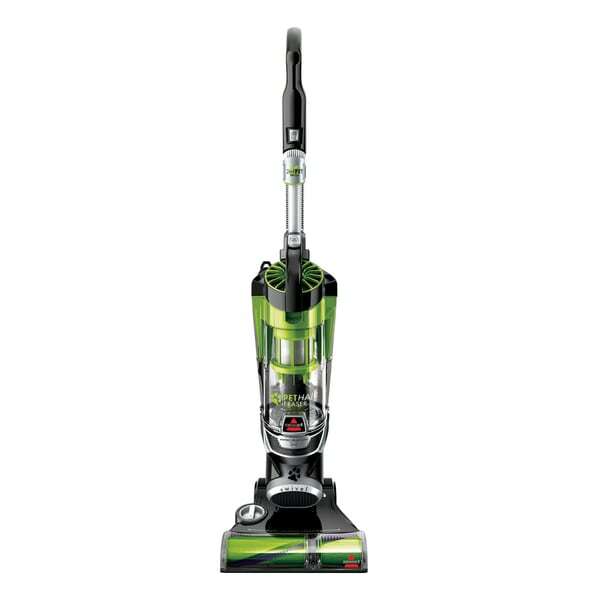 If you are looking for a true pet friendly vacuum this is it. I am very happy with this purchase. Definitely recommend. Great vacuum if you have a dog that sheds. I like the various attachments that come with it. I use this vacuum on hard wood floors and area rugs. You can easily adjust the height level you want it to be. The brush attachment works well on furniture to pick up the dog hair too! It also has a small attachment that I use for under cabinets and stuff. The only negative is the hose for the attachments is not super long. Works wonderfully. Purchased it for dog hair and it really does the job. The attachments make it super easy for furniture and hard to reach places. love love this vacuum cleaner. It gets up all the cat and dog hair soo well.it is a little heavy but worth it because it cleans all floors well. iwould recommend this vacuum cleaner to anyone with pets. This vacuum cleaner has been wonderful. Extremely easy to use. I did have one clog because of leaves and dog hair, but it was very easy to find the clog and remove it. So I seem to collect vacuums like others collect watches. This by far is my favorite vacuum for pet hair. I have two dogs currently and at time of purchase had four whom shed like there is no tomorrow. This vacuum has no problems making area rugs look like new. Easily maneuvers and easy to empty when full. LOVE this vacuum!! If I had my time again I would not buy this product, our previous vacuum the Shark Navigator Lift-away is miles better. but you live and learn. Positives, looks good, lots of tools, 9 metre cable. Negatives, creates you twice as much work, leaves black scuff marks on tiled floors, so you have to go round wiping them up once you have finished, so takes you longer. Tools are not very handy to use, and the brush does not pick up Labrador hair. Conclusion, do not buy a waste of money, we paid ***, now available for *** in places. The updated model of the Shark is ***, I got mine originally for *** but you pay for what you get, most of the time. "Is it safe for a hardwood floors?" Yes, this vacuum is safe for Hardwood floors. For best performance on hard floors, turn off the brush roll to keep it from spinning. Because it's proven itself to help remove all the pet hair.